"Energy poverty and vulnerable consumers in the energy sector: analysis of policies and measures"
Summary: In the absence of a common EU-wide definition of "vulnerable consumers", the study looks at how the 28 Member States approach the issue. It identifies successful solutions that have been implemented accross the EU, while considering their transferability. Special focus is given to assessing best practice solutions which aim at serving all stakeholders in the long-term rather than just paying bills or providing short-term assistance (e.g., subsidies). This study supports the work engaged by the European Commission to assist Member States with accurately defining the concept of vulnerable customers as required by the directives 2009/72/EC and 2009/73/EC of the European Parliament and the Council, envisage soft EU measures to mitigate the situation for vulnerable consumers and energy poor, and provide recommendations on most effective measures and tools to support such consumers. 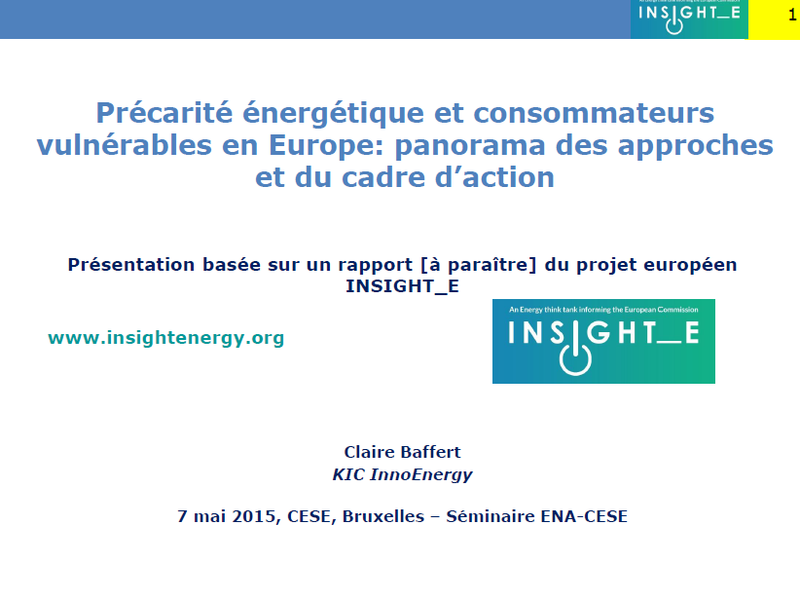 Read the presentation of our preliminary research results at the Citizens' Energy Forum on 12 March 2015 by Steve Pye (UCL). 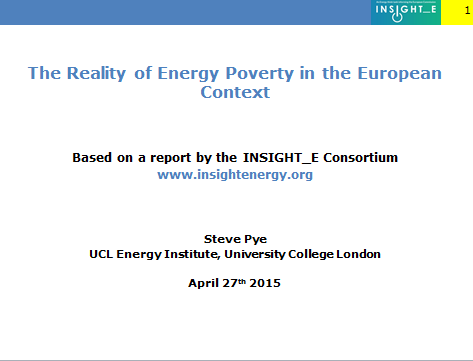 Presentation of the full study by Steve Pye (UCL) at Energy poverty conference organised by the Barcelona Menéndez Pelayo International University Consortium (CUIMPB) on 27 April 2015. Presentation of the study in FRENCH. If you wish to send suggestions or input for this ongoing work, please leave a message on our interactive platform. The European Commission reconvened the Vulnerable Consumers Working Group in EU energy markets with a meeting held in Brussels on 3rd June, 2015. This follows conclusions from the 7th Citizen’s Energy Forum held in London in March of this year. 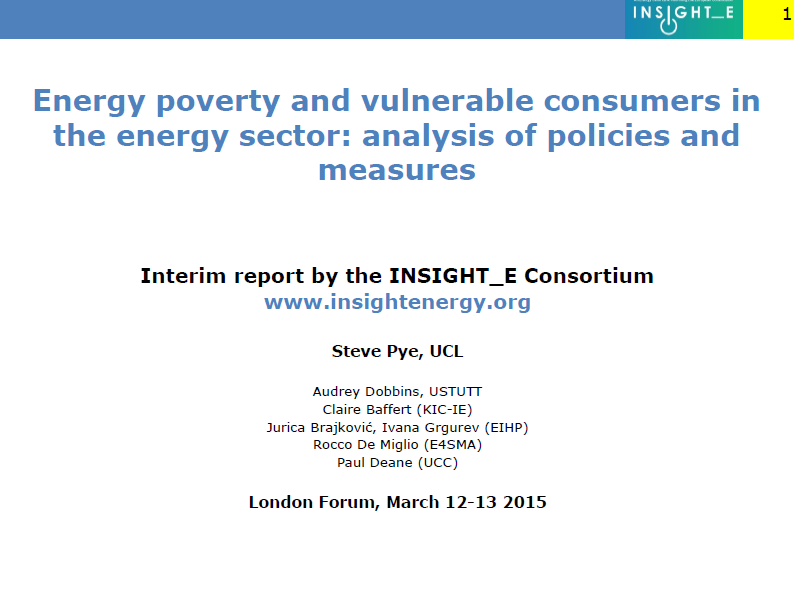 The INSIGHT_E policy report on “Energy poverty and vulnerable consumers in the energy sector across the EU: analysis of policies and measures” was presented by Audrey Dobbins of the University of Stuttgart. This paper will provide policy recommendations on initiating research for developing pellet firings with lower emissions or dust filters for small firings, and, tightening emission limits for solid fuel burning in Europe. This HET will describe the minimum physical characteristics and requirements of the power, industry, buildings and transport sectors, to remain on track for 2050 emissions reduction targets. A policy based discussion will be included in the paper. Read Rapid Response Energy Brief no.3 on "Electricity market design options for promoting low carbon technologies"
Executive Summary: The increasing share of electricity production from renewables is achieved by political promotion strategies like feed-in tariffs, which foresee payments for renewables outside of the electricity market. Assuming a phase out of the existing promotion strategies, the question arises if other or additional market design options for promoting low carbon technologies are necessary. 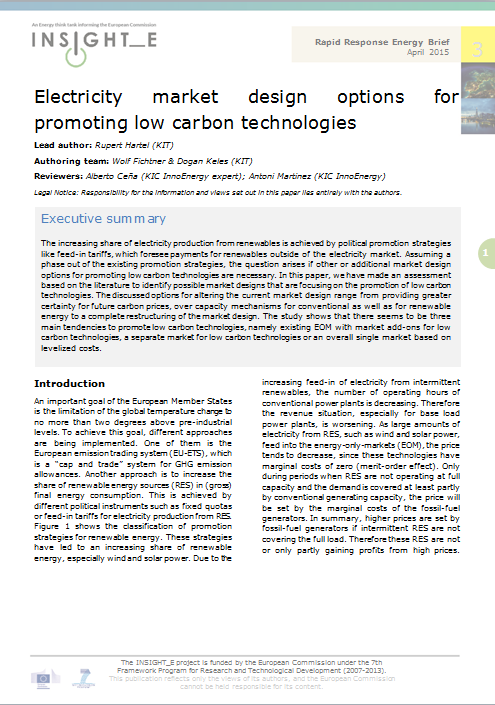 In this paper, we have made an assessment based on the literature to identify possible market designs that are focusing on the promotion of low carbon technologies. The discussed options for altering the current market design range from providing greater certainty for future carbon prices, over capacity mechanisms for conventional as well as for renewable energy to a complete restructuring of the market design. The study shows that there seems to be three main tendencies to promote low carbon technologies, namely existing EOM with market add-ons for low carbon technologies, a separate market for low carbon technologies or an overall single market based on levelized costs. If you want to react to this paper and leave comments for the author, please go to our interactive platform. 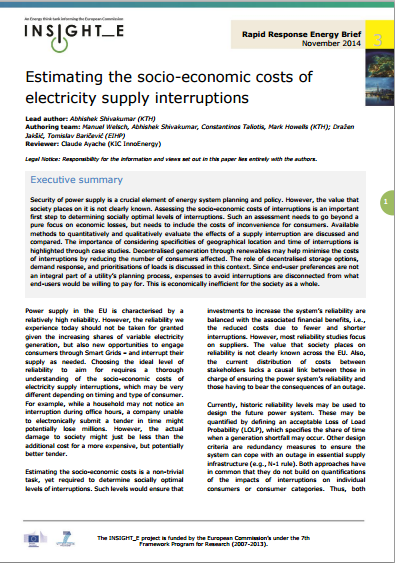 Read Rapid Response Energy Brief no.2 on "Estimating the socio-economic costs of electricity supply interruptions"
Executive Summary: "Security of power supply is a crucial element of energy system planning and policy. However, the value that society places on it is not clearly known. Assessing the socio-economic costs of interruptions is an important first step to determining socially optimal levels of interruptions. Such an assessment needs to go beyond a pure focus on economic losses, but needs to include the costs of inconvenience for consumers. Available methods to quantitatively and qualitatively evaluate the effects of a supply interruption are discussed and compared. The importance of considering specificities of geographical location and time of interruptions is highlighted through case studies. Decentralised generation through renewables may help minimise the costs of interruptions by reducing the number of consumers affected. The role of decentralised storage options, demand response, and prioritisations of loads is discussed in this context. Since end-user preferences are not an integral part of a utility’s planning process, expenses to avoid interruptions are disconnected from what end-users would be willing to pay for. This is economically inefficient for the society as a whole." If you wish to react to this paper, please leave a comment on our interactive platform.